Blackinton B1160 Badge with Eagle and Flags - B1160 - 3" x 2 1/4"
Home > Blackinton > Police Badges > Badges with Eagles > B1160 Badge with Eagle and Flags - B1160 - 3" x 2 1/4"
B1160 Badge with Eagle and Flags - B1160 - 3" x 2 1/4"
This beautifully crafted badge from Blackinton features two fully colored flags on each side and a star at the top. Default color for star is blue but can be changed upon request. This badge has an eagle that sits in the center coming up behind your custom seal. The shield has four panels for your own lettering. This Blackinton model B1160 with eagle and flags measures 3" x 2 1/4". Like all Blackinton badges, it is made in the USA. Please allow 4-6 weeks for delivery. 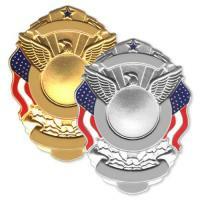 Badge with Semi Circular Panel - B591-X - 2 1/8" x 3"
©2002-2019 CopsPlus.com: Blackinton B1160 Badge with Eagle and Flags - B1160 - 3" x 2 1/4"